Nora Aunor and Tirso Cruz III Reunite in Studio5 "When I Fall InLove"
Philippine cinema's most popular loveteam of all time reunite in TV5's made for TV movie "When I Fall In Love". 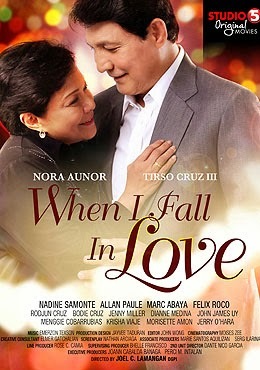 Nora Aunor and Tirso Cruz III, who comprise the famous Guy and Pip loveteam in the late 60’s until the 1980s, are paired anew in the Joel Lamangan directed romantic-family drama "When I Fall In Love" two decades after their last film "Bilangin ang Mga Bituin sa Langit." The series features Guy and Pip as the Buenaventura couple, Fely and Armando, whose touching love story is told as the narration shifts to and fro past and present events of their lives. A year before their 40th wedding anniversary, Armando, a doctor, is diagnosed with Stage 4 pancreatic cancer. Resigned to the fact that his chances of recovery are slim, he chooses to spend the little time he has left with Fely and his three children: Ricky (Marc Abaya), Nica (Nadine Samonte), and Louie (Felix Roco). Armando, who tries to remain optimistic despite his illness, wishes to renew his marriage vows with Fely. Although the film portrays Fely and Armando as an affluent couple who maintain an endearing affection for each other despite being married for many years, When I Fall In Love gradually reveals the scars of their relationship and the imperfections of their family. "When I Fall In Love" airs on February 11, Tuesday, at 8:00 PM on TV5 as part of Studio5 Original Movies, a collection of "made-for-TV" movies.